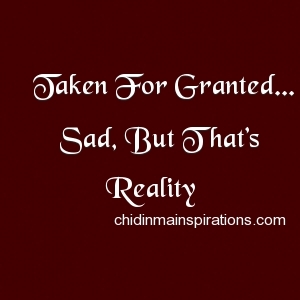 How painful does it feel when we taken for granted? Sometimes if not most times, words are not enough to truly how it feels to be taken granted. While others, there are not enough words to describe it no matter rich with words with dictionary is. Now, turning things to you, can you explain how someone else feels when we taken them for granted. Of course, the answer is no. life as a whole. There are some many things we take for granted. Many atimes it is not like we intentionally take these things for granted but we are so occupied with ''things'' to see the priceless occurrence in our lives. -When we fall sick and recover, we see it as a ''normal thing'' when someone passed away from that same illness or someone is fighting for his/her life for months now just because of a ''simple'' illness. - We go out and return and see it as a ''normal thing'' when many we went out and never returned either as a result of an accident or they passed away or they went missing. - We have clothes in our closest and see it as a ''normal thing'' when someone is searching the bins just to see something worthy to cover his/her nakedness. - We drive out and return but see it as a ''normal thing'' while some are fighting for a second chance to life as a result of an accident encountered along the way. - We have food and clean water to drink to see it as a ''normal thing'' when to see is a problem for some not to talk of clean water. - We can see...see the world but see it as a ''normal thing'' when all what a particular person needs is to see the world for just one second. - We can walk, move around or do whatever it is we want but we see it as a ''normal thing'' when some people are stranded on their beds for life. - We have a family who loves us and can do anything for us but we see it as a ''normal thing'' when there are people who will do anything to have a family or get their family back. - We have someone who loves us dearly but to us that's just a ''normal thing'' when someone or many are craving for love or to be loved by someone but they do not have that. - We read and pass but see it as a ''normal thing'' while some read more than us but didn't pass or can't understand no matter how hard they try. ...The many things in life we take for granted. The many things in life we see a ''normal thing''. The many things in life we fail to acknowledge God for. If only we could take Him (God). If only we could see those ''normal things'' as rare privileges. If only we stop taking things for granted. If only we are more thankful.